Get the sound of this vintage Italian monosynth. SampleRadar is taking the slightly unusual step of featuring just one instrument this week. All the sounds in this collection were created using the Jen SX1000 monosynth, which was on the market in the late '70s and early '80s. There's still plenty of variety, though, and many of the samples have been processed to give them extra potency. 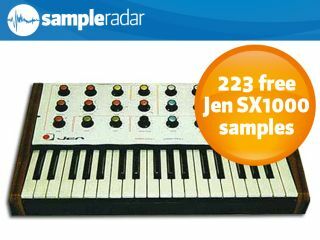 The Jen SX1000 breaks are split into three folders: Drums, Loops n Lines and Tape Echo Noises. The Jen SX1000 samples are supplied in a zip file, so you'll need to extract them before you can see them. Enjoy!